Traditional or high-speed ferries take passengers from Point Judith, on the mainland of Rhode Island, and Newport to Block Island. 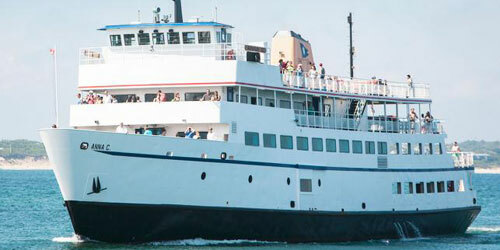 Traditional and fast ferries cross from Block Island to Montauk, New York. 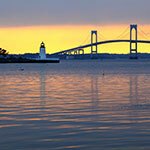 A Jamestown-to-Newport ferry crosses between these two Rhode Island islands. A ferry route crosses from North Kingstown in Rhode Island to Martha's Vineyard, Massachusetts. Interstate Navigation will sail you away on the Bock Island Ferry! 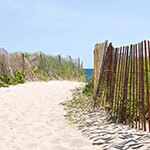 Begin your journey to island life from Point Judith, RI and enjoy a trip on a traditional passenger and vehicle ferry. Indulge in a treat from the snack bar or sip a legendary Bloody Mary before you enjoy Block Island's free public beaches, great restaurants, shops and historic landmarks. Stay on Block Island for the day or relax a little longer in a Victorian era hotel. 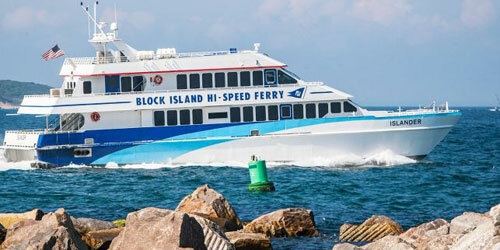 The Block Island Ferry sets sail several times daily and can accommodate cars and motorcycles. Visit our website to view the schedule and rates or book passenger tickets. 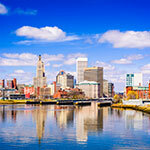 Hi-speed ferry service is also available from Point Judith, Newport, and Fall River, MA. Hurry up and relax by taking Block lsland's hi-speed ferry service! The ferry runs seasonally (May-October) from Point Judith and will deliver you to carefree island life in only thirty minutes. During the summer months, two more hi-speed locations are added in downtown Newport, RI and Fall River, MA. Wherever you sail from, you can get to Block Island quickly to enjoy the restaurants, shops, hiking, biking and free public beaches that await. Come for the day or enjoy a longer stay in a Victorian-era hotel. Boats depart multiple times daily. Visit our website to book your tickets online and view schedules. 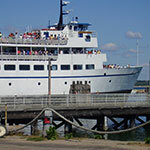 Seasonal passenger ferry from Quonset Point to Oak Bluffs on Martha’s Vineyard. Crossing takes about 90 minutes. 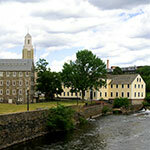 Company also offers shuttle services to/from the Providence Airport and the Amtrak Station. Dockside parking and online reservations. Ferry does not transport motor vehicles. Only ferry from Rhode Island to Martha's Vineyard. State of the art high speed catamaran takes you from Quonset, Rhode Island to Oak Bluffs, Martha's Vineyard in 90 minutes. Ferry does not transport motor vehicles.